Welding is an extremely common fabrication process, but welding is also a dangerous process. It involves high temperatures, flammable gases, and high voltages, depending on the specific process that is used. Many precautions must taken by the welder to ensure his own safety and the safety of those around him. Welding equipment needs to be properly maintained and operated using manufacturer instructions to ensure safety during the welding process. Fuel gases such as acetylene must be properly stored in proper cylinders and secured in a canister stand or cart. The regulators on gas cylinders must be regularly calibrated to insure that the actual output matches the gauge. Welders must read the instruction manual for their specific welding machines, and understand how to set and adjust the settings on the machine. For arc welding, the circuit must be properly grounded to prevent electrocution. The electrodes or filler rods must be sized for the specific job, based on the material being welding and the thickness of the part. For torch welding, the torch and the tip must be selected for the specific welding gas that is used. Welders must wear a variety of equipment to protect themselves from the various hazards of welding. The most ubiquitous piece of welding safety equipment is the welder’s helmet. The helmet serves two purposes: to protect the welder’s eyes from the intense light of the welding process, and to protect his face and neck from sparks and spatter. The welder’s helmet incorporates a darkened glass view plate that reduces the amount of visible light and UV radiation that reaches the welder’s eyes while still allowing him to adequately view the work piece. In addition to the helmet, welders also don gloves, long pants and shirt sleeves, and an apron or coveralls. Protective clothing is usually made from leather to prevent sparks from causing burns. For some welding applications where fumes can be generated, such as in brass welding, welders wear respirators under their helmets to prevent them from breathing toxic fumes. The welding process can not adversely affect the welder, but any personnel around him. 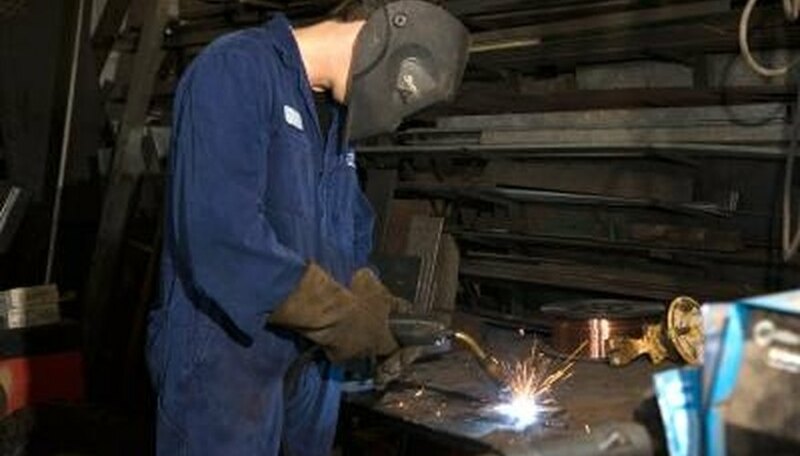 Welders need to protect their work space by erecting a screen or partition to prevent people who are walking by from being exposed to the bright lights of the welding process. Ventilation is also important for the welder and other personnel. Adequate ventilation is required to prevent gases, such as carbon dioxide from building up in the welding area. Kristoff, Susan. "Safety Checklist Before Welding." Sciencing, https://sciencing.com/safety-checklist-before-welding-6173742.html. 24 April 2017.